The JOIDES Resolution vessel is now at our first site, which has the exciting name of U1518. You can sense the anticipation amongst all the scientists and technicians because in a few hours time we will be putting the drill down and pulling out the first cores for IODP Expedition 375. Coring is done by lowering a long drill down below the seabed, and pulling out long, tubular core samples, much like an apple corer into an apple. When the tubes are pulled out, they contain a core sample of the rocks below. At our first site, we will be lowering the drill down 2700m to the sea floor, then drilling into the sediment below for another 600m (we call this 600mbsf which means metres below sea floor). Why are we coring here? Site 1 is where the frontal thrust of the Hikurangi subduction zone is located. The fault separates the Australian plate above from the Pacific plate below. This region is interesting because just after the M 7.8 Kaikoura earthquake in 2016 it set off a slow slip event here, which set this area shaking slowly like jelly in a bowl. It is also one of the shallowest subduction zones in the world, making it possible for an earth science ship like the JOIDES Resolution to drill into and study. This diagram shows the block farthest to the right is shaped kind of like a foot, we call that the foot wall and here at the Hikurangi Subduction Zone that forms part of the Pacific plate. The block on the left forms part of the Australian plate and it is resting or hanging on top of the footwall block, so it’s called the hanging wall. An easy way to remember it is the hanging wall block is always above the fault plane, while the foot wall block is always below the fault plane. 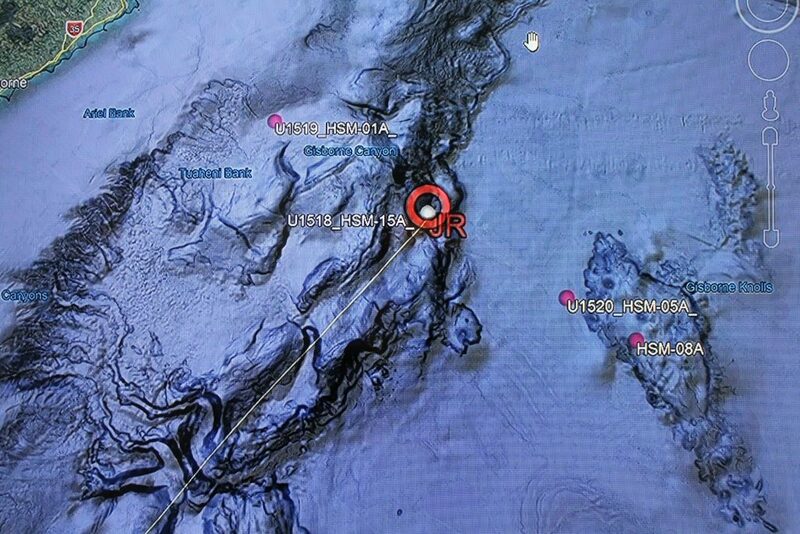 We will be at this site coring for the next 5 days, and the core samples we bring up will be carefully matched with the seismic data already collected. Scientists will run lots of different experiments on them straight away in the labs, and also do more testing after the expedition. Each core is cut into 1.5 metre sections and tested for its physical properties, micro fossils, magnetic signature, density and moisture content. The cores are described by sedimentologists too, who record the different layers and types of rock in the core. Additionally, the chemistry lab run a lot of tests on how much sea water is in the sample, and what types (and amounts) of elements and minerals there are present. 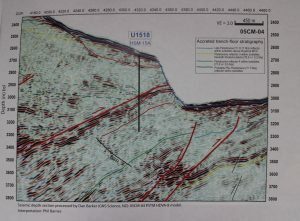 All the information is collated to build a very detailed story of this frontal thrust site and its architecture – how the rocks were formed, when they were formed, and their properties.This work will help us understand the subduction zone and why it experiences slow slip earthquakes far better than we do now. After 5 days of busy coring we will drill a new hole very close by and lower in New Zealand’s first deep sea observatory. More on this next week!